Lemmon, Vernon William, 94, passed away July 20, 2010 in Mesa, AZ. He was born Oct 20, 1915 in Silver City, Utah. He married his eternal companion Rae Owens in 1937. They moved from UT to CA with 2 small children Leroy & Carol. Later Joanna & Phill were born. They raised their family in CA & moved to Mesa in 1963 to buy & run their own business & to be around their grandchildren as they were born. They owned an ‘A&W Root Beer Family Restaurant’ in Mesa for 35 years. In CA Vernon had been employed at a ‘76 Union Oil Refinery’ for 18 years as a pipe fitter. He graduated from High School receiving the Citizenship Medal. He loved performing in the plays & drama programs at school – usually playing the villain. He was an active member of the LDS church, serving faithfully in many callings including stake missionary, teacher, bishopric, high counsel, LA temple sealing-coordinator, ward Sunday school president, stake Sunday School President & many more. Each calling was the most important one in the church. 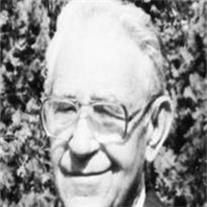 One of his favorite callings was ‘Filling the Baptismal Font’, he said, ‘without that calling the church could not move forward.’ He was preceded in death by his wife Rae, his parents John S. Lemmon & Verna Bradfield Lemmon, brothers: Ralph, John, Neldo, Elmont, & Lamor. Sisters: Nora, Inez, & Elaine, also a daughter-in-law Lurrine Lemmon. He is survived by his wife of 15 years Ina Shupe, sister Beth Neilsen, sons Leroy & Phill. Daughters Carol Sutton (Charlie) & Joanna Carbone. Vernon and Rae have 4 children, 6 grandchildren, & 15 great-grandchildren. They were all the most important blessings in their lives! The family will miss his fine example of honesty & integrity, along with his strong testimony of our Savior & faith in the Resurrection. Visitation will be Monday July 26, 6-8 PM at Bunker’s Garden Chapel, 33 N Centennial Way, Mesa, AZ. Funeral services will be Tuesday July 27, 10 AM with a visitation at 9 AM at the LDS Mesa Solomon ward building, 977 E Broadway Rd. Mesa.